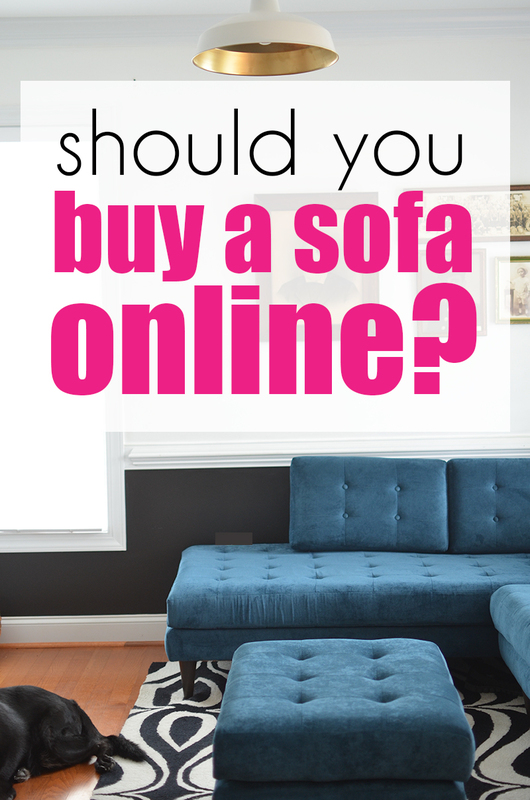 How to buy a sofa online - it can be done! 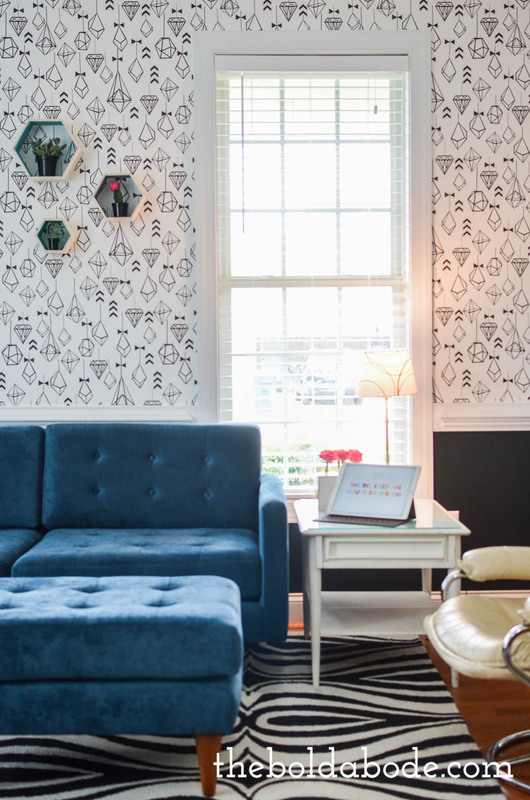 Should you buy a sofa online? You guys! I can’t believe it. My sectional finally arrived, and it’s seriously made such a huge impact in, not only the room, but our lives as a family. I never thought I would actually figure out how to buy a sofa online. I’ve always bought my furniture in person, but somehow, I’ve made some serious mistakes even though I’ve been able to sit and touch and feel it. You see, for years we had this gold colored couch that, though it “looked” ok, just wasn’t comfortable. I was going for Pottery Barn style on a Walmart budget! It had these big poufy, attached back cushions, that instead of allowing you to melt down into them, would fight with you and try to push you off. I guess it was too Kardashian to be sat upon. And forget naps! When I’d try to lie down and take a snooze… half my body was hanging off dangling precariously over the floor. No bueno. So, when I decided it was time to take the splurge, I knew it wasn’t going to cut it locally. Been there, done that. When I bought our previous sofa, I scoured the area looking for the most stylish, most comfortable sofa I could find. It was slim pickins. (within our budget) This time, I decided to up my budget quite a bit, and I had my heart set on something a little more mid-century modern that would house all four of our tall people bodies. I knew there was no way I was going to find that around town. At least not in a sectional. That meant… dun, dun, dun. SHOPPING ONLINE FOR A SOFA. But I did it and it worked out pretty darn good. Today, I’m going to spill the beans and share my online sofa shopping adventures. If you’re going to buy a sofa online, the first thing you need is time. This is no rush job. You seriously don’t want to just find a good-lookin’ couch and call it a day. There are SO many visually beautiful sofas on the internet that it’s tempting to just go on a pretty picture. I was intoxicated by some very pretty sofas, but I knew better after my first buying experience. As with hunky dudes, looks aren’t everything. Plan to spend several weeks perusing and thinking things over. Next, you want to narrow down your style. I pretty much knew at the outset I was going for Mid Century Modern. I wanted clean lines and tapered legs. I wanted a pretty color and soft fabric. I admit, I came across some gorgeous Chesterfields and was on the fence for a while. But, I knew that style wouldn’t fit our needs as a family. If you can decide early on what look you are going for, it’s going to make the process much easier because it will help you narrow down which companies you are considering. Think about what you want out of your sofa. If you need a loungy space like we do, you want to opt for something with deeper seats and lower arms. A Chesterfield is glamorous, but I knew that the high arms were not going to be conducive to splaying out all over the place and relaxing for a movie marathon. We also needed something much larger. There are only four of us, but we’re tall people. My husband, Morgan, is 6’3″ and my oldest is millimeters from catching up with him. I’m 5′ 11″ and my youngest is growing faster than a weed on speed-weed-feed. If your family is smaller, you might not need a larger sofa, but it’s important to think about how you are going to use the couch and what you want to get out of it. Next, you want to do some serious research. Once I narrowed down my style, that eliminated several companies from the running. But, I did find a few that specialized in the Mid Century Modern style. After that, I did TONS of stalking. I stalked them on Instagram and Facebook, checking to see how they handled their customer service (because, you know people love to complain publicly) and how their customers felt about their products. I don’t get too scared when I see a negative comment on social media. What is most important is how that company handled it. How did they respond? Did they respond? You can learn a lot about a company just by watching their social media accounts. I searched for non-sponsored reviews, which you can find by looking for hashtags the company uses or just googling. You can pretty much tell if a review is sponsored these days because bloggers are required to disclose that at the top of their posts. If it’s not at the top, check right after the first image and/or at the very bottom of the post. Now I’m not saying that a paid review isn’t honest, ( Though I’ve pretty much stopped doing paid reviews, I have done them in the past and always tried to keep it on the up and up) but there is always going to be that cloud floating over head that an un-paid review just won’t have. Side note: I do think receiving free product to review is different from getting paid to review that product. I just don’t really feel good about getting paid to review products anymore. It makes me feel like I can’t be totally honest…like real and raw honesty. But that doesn’t mean I can’t or that other bloggers aren’t. It’s just how I am feeling at the present. That’s why I run ads on my site. I’m working to write eBooks and other helpful resources so that someday I will be able to reduce the ads, but for now, they allow me to bring creative and honest content to you without feeling like I’m selling my soul to a brand. You might see a sponsored post every now and again, but if you do, you can be darn sure it’s because I love that company and use their products. I’ll be doing an in-depth review about my sectional very soon. I didn’t get the sofa for free and the review is un-paid. I’ll disclose every single thing that happened and how it’s holding up so far. Obviously, you know I’m in love with it, but there are some interesting things I think you need to know about my experience with this particular company. Even though I do love the sectional, neither the experience, nor the sectional, were and/or are perfect. One last idea is to reach out to real people. If you find a review on facebook or Instagram, try to message the person and ask to get their honest opinion. And ask around locally to see if any of your friends have worked with an online furniture company. Exhaust all avenues! Make sure to take your time with this part of your online sofa buying process. Since you can’t touch, feel or sit on a virtual sofa, do your due diligence before you even start looking at what gorgeous fabric you want to choose. Hardwood frame – Be careful of plywood and fiberboard. If it’s not hardwood, cough. cough. Ikea, you might find the construction less than adequate for the long haul. Joints that are glued, stapled and screwed or doweled – Dovetail joints are going to be BY FAR superior, but if they aren’t glued, stapled, AND screwed, that could be an indicator of sub-standard construction. Cushions that are made with at least hi-density foam. – Foam is okay, but if it isn’t at least hi-density, it’s going to cave. But cushions with just down feathers will smush, and you’ll be constantly having to fluff. If you can find hi-density foam that is wrapped in down, you’ll have the best of both worlds, but you’re going to pay for it. Sturdy springs – A large majority of economically priced sofas are going to have serpentine springs, which are fine. Just be wary if they say they only use mesh or webbing. Mesh and webbing are going to be too flimsy for heavy use. The high-end sofas should have eight way hand tied springs, so if you are looking at dropping some serious cash, make sure this is what you get. Durable fabric – Fabric is last, but not least. You want to make sure you get durable fabric that will hold up under constant lounging. Cotton and linen are a good choice, but even when stain-treated, can be hard to clean. Be careful of printed patterns, because they will wear unevenly. I have a friend with a lovely flowered sofa, and it was beautiful for the first year or so. Now on some of the more used areas, the pattern is strikingly faded. And make sure it meets the Upholstered Furniture Action Council’s fire-safety guidelines. Warranty – Most reputable manufacturers are going to have at least a 10-year warranty covering the frame and the suspension system. Some even have a limited life-time warranty on the construction (not the upholstery). Be aware of what you’ll be getting so you know in advance. Shipping – Find out about shipping costs. Some companies have free shipping, and that is da bomb. Some even have free shipping back if something is wrong. Be sure you know what the options are when it comes to shipping. Is it to the curb, the door or white glove. White glove is the best. They will unwrap your sofa, bring it inside, assemble if it needs it, and place it where you want it. Lead Time – Make sure to ask how long it will take to construct your sofa (if it is a custom order) and how long it will take to ship it. Then, in your head, add a couple of weeks on the construction time that they quote you… just so you don’t have your heart set on getting it in 6 weeks, only to have it extended to 8. If you plan that big house warming party the day after they say it will be delivered, and there’s a hiccup, there will be sadness galore. Give the company some cushion on it’s quote. If they deliver on time, then you’ll be pleasantly surprised! Return Policy – most custom ordered items are going to be final sale. You might come across a great company with a 100% guarantee, and that, in my humble opinion speaks volumes. Especially if they are in L.A. and you are in Virginia. Major shipping costs, right? Once you narrow down the companies to two or three it’s time to order swatches. Most online companies offer to send swatches of fabric. So pick out several of your favorites in a variety of colors and order them. I lived with my swatches for a few weeks, feeling them for softness and sturdiness, laying them in the room to watch how the light interacted with the color and the texture. I spent three weeks playing around with them. I was actually able to eliminate two of my three companies just based on the fabric options. I knew I wanted a velvet-like (not velvet) fabric, and only one had what I wanted. If you are really concerned about the fabric, once you’ve narrowed down your fabric choice to two or three, you could ask for a larger swatch. I didn’t do this and it worked out fine, but if I hadn’t fallen immediately in love with this certain fabric, I would have done this! Now that the research phase is over, it’s time to get down to the nitty-gritty and start planning your space. You’ve got your company, you’ve picked a few sofas you like. Now it’s time to get practical. There are two ways to deal with space and size planning. Plan it out on paper – get some graph paper and sketch out the dimensions of your room to scale. Then take the measurements of the sofas you like and cut them out of a separate sheet of graph paper. That way you can get an idea of the scale of the piece within your room and move it around to see where it might fit best. Grab the tape and get real – This is what I did. I wanted to have a real-size opportunity to decide how big I could go. My room is a little bit smaller since we switched the family room and dining room, so I wanted to know, in real life, how much space this guy was going to take up. I took the measurements from the website and literally taped it out (in painter’s tape) on the floor. It gave me a realistic view of how big the sectional was and how it would fit in my room. Once you’ve gotten a good idea as to size, sit with it for a while. Once I taped off the measurements, I let it stay there for a couple of weeks. I wanted to live with the dimensions for a bit to be sure it was going to work. I visualized how the furniture would be placed in the room around the taped area, and I would walk around the room to be sure there was good traffic flow. Call me crazy, but I did not want to drop a few grand on something that would be too large (or too small) for the room. Finally, it’s time to order! After all that work, it’s time to take the plunge. But before you do… STOP. Listen to your inner voice and be sure it’s the right purchase. I’ve worked very hard to listen carefully to my intuition over the past few years, and if I get very quiet and hear what it is really saying, it makes a big difference in how everything works out. We were going to buy a newer car in January, and when it came time to send the paperwork over to the bank, my inner voice started screaming to me that it wasn’t the time. I’m so glad I listened because we ended up owing several thousand dollars in taxes. It would have been fine, but now, I can take what would have been a car payment and pay off the tax debt. Whew! Now you might be thinking that, Gwen… this is just a sofa. But anytime you are going to spend four to five figures on a sight-unseen purchase, you have GOT to listen to your gut. My rule is to always sleep on any major purchase. It’s always good to give yourself some time to make a non-emotional decision. Buying emotionally can be disastrous. If you are feeling that rush of adrenaline, it might behoove you to sleep on it for two nights! Once you’ve ordered, let go of the need for it to be perfect. I can guarantee that something isn’t going to be right. No matter how much research you do, there is always the potential for issues. For example, the legs on my ottoman are the wrong color. I’m waiting for replacements, which I hope will be here soon. Fortunately, nothing was damaged during shipping. Traveling thousands of miles without damage is really something to celebrate. Release the need for perfection. Perfectionism is the enemy of peace! Buying a sofa online can seem daunting, but I can say from personal experience that it can be done successfully. 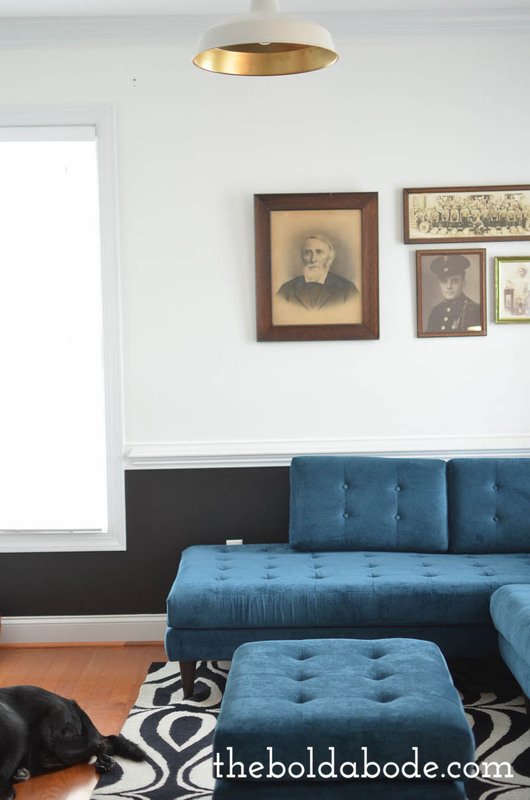 If you take your time, do your research, plan out your space, order swatches and inform yourself of all the moving parts with shipping and warranties, you can end up with a beautifully made, well-fitting piece of furniture that will last for years and benefit the needs of your family. Here are a few shots of my Elliot Sectional in Elizabeth Ocean from Joybird. What do you think? So why do you think? 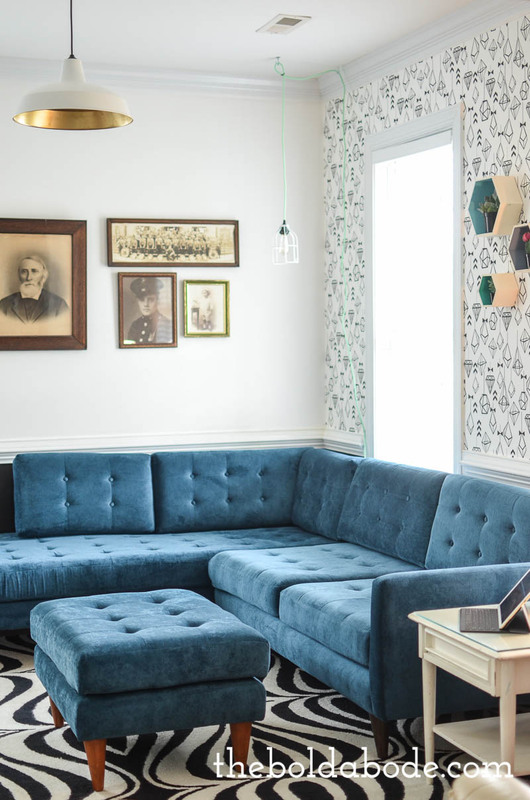 Should you buy a sofa online? Or should you go to the store so you can sit your tooshie on it?